This woodblock print by Utamaro is from a series called Fuzoku Bijin Tokei (Women’s Daily Customs). 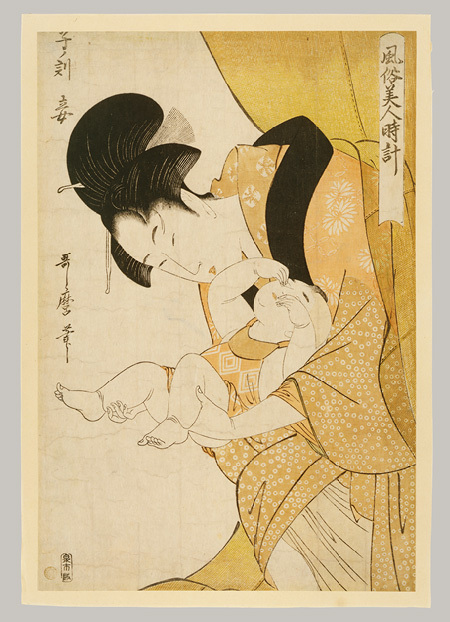 To illustrate the “daily custom” of midnight, Utamaro depicts a mother sleepily emerging from her mosquito net to attend to her baby (who in turn rubs sleep from its own eyes). Having lost many hours of sleep myself when my son was a newborn, I can relate! A little more information about this print is available HERE. What are your favorite images of mothers with children? Why do you particularly like them? 1 Museum label for Marie Danforth Page, Her Littlest One, Washington, D.C., National Museum of Women in the Arts, June 11, 2013. I love Orientalist versions of the mother and baby bond, especially people like Rudolf Ernst, Frederick Bridgman, Frederick Goodall etc. My guess is that European artists were prepared to show North African women getting into touch, nakedness, naturalness and love …more than they were prepared to show European women. Hi Hels! Thanks for your comment! I haven’t really explored this side of Orientalism before, so I’m glad that you mentioned it. It seems to me that these depictions of mothers and children has some parallels with other 19th-century French depictions of women in nature. Both conservative painters like Leon Augustin L’hermitte and primivitist artists like Gauguin were interested in depicting women in outdoor settings, in which women functioned as symbols of nature and fertility. I think that this Orientalist subject matter could be related to similar ideas: the fertility of the exotic Other and the “naturalness” you mentioned. After going through some images by the artists you listed, I found found one by Frederick Goodall which was particularly appealing to me: “Coptic Mother and Child” (1875). I do like your choices very much and I’d like to add a couple of my favourites, two linked works by the Spanish Painter, Joaquín Sorolla (1863-1923). His wife Clotilde was his favourite model, preferred sitter and constant muse, and he painted her and their children many times. 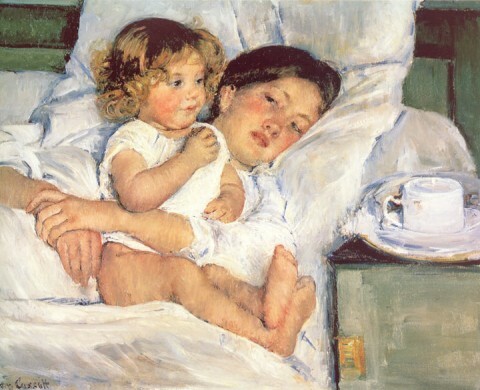 The first is small oil sketch, Clotilde en el Lecho (Clotilde in Bed), 12.6 x 19.4 cm, (1895), just after the birth of their third child. She is looking directly at the painter, and he has captured the moment in a quick, loosely painted, sketch. It is a spontaneous and intimate glimpse of family life. 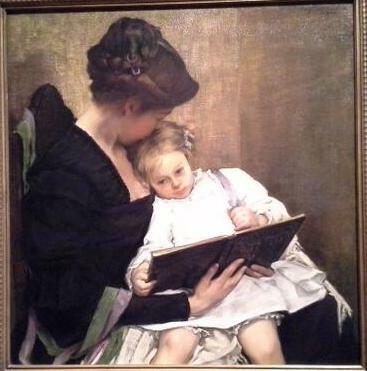 Madre is a much larger, more finished work, 125 x 169 cm, (c.1895-1900) clearly based on the first sketch, but presented as a more universal view of motherhood, with the mother looking at her baby and not at the viewer. This is an exercise in exploring the colour white in a range of shades and textures, the pillows, the bedspread, the walls, only the heads of mother and child break the expanse of white. I think the two show something of the process of painting, from the quick recording of a moment to the later full exploration of a more finished work. There are other equally engaging paintings of the family over many years – I particularly like Mi Mujer y Mis Hijos (1896-7), 160 x 150cm, although I feel the thumbnail on the website does not do justice to the piece. 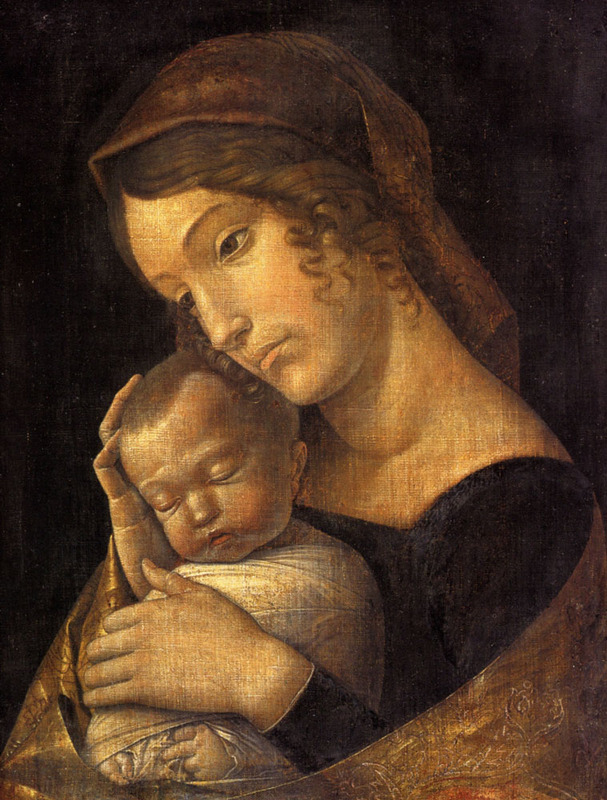 I like how the Virgin is cradling the Child’s head with her hand. 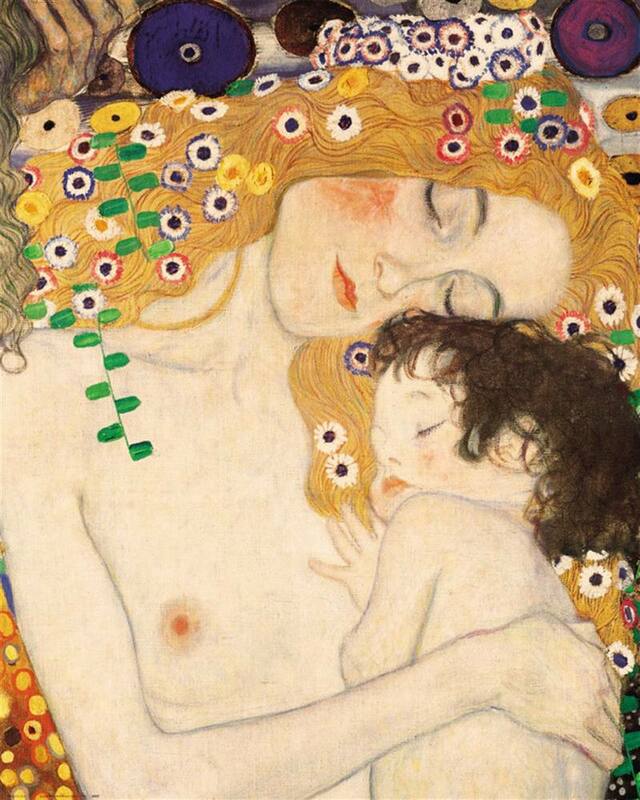 It seems like the softness of her touch is echoed by the soft curls that frame the Virgin’s face. Hi Rebecca! Thanks for your comment! I’ve never seen several of these images by Picasso, so I really appreciated your post. I think it is interesting how Picasso’s aesthetic changes around 1921, because (as you mentioned) he became a father. Picasso had four children by three different women, and the first child (Paulo) was born in 1921. 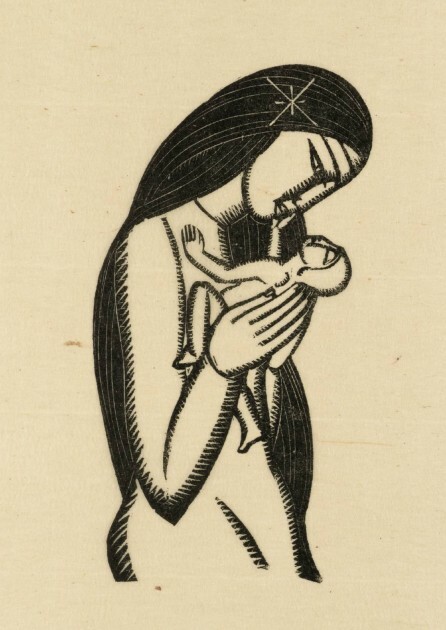 With that in mind, it’s interesting to look at the images you compiled and see how frequently Picasso depicted the theme of maternity, even before he had child of his own. Hi Anne! Thanks so much for sharing these images. I was not familiar with Sorolla before reading your comment. 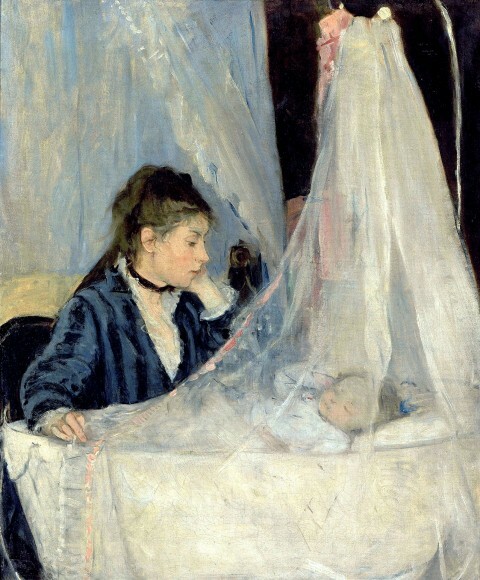 The second picture (“Madre”) appeals quite a bit to me, where the mother is looking at her baby in the bed. The various white colors and textures are really eye-catching; I like how the softness of the bed contrasts with the hard wall. Plus, I can relate to the experience of lying in bed, watching a baby sleep! The Museo Sorolla in Madrid is a beautiful museum, originally the artist’s home and studio, and well worth a visit, it’s regularly referred to as one of the city’ s hidden jewels (although thanks to the enthusiastic reviews on Trip Advisor, not as hidden as it was). In the US, I believe the Hispanic Society of America, in New York, has the most important collection of his paintings, including fourteen huge murals they commissioned and which have been recently restored. They also have works by. Velazquez and Goya. I love the variety of styles and depictions you’ve gathered here. I really enjoy the self-portraits by Elisabeth-Louise Vigée Lebrun which include her daughter. 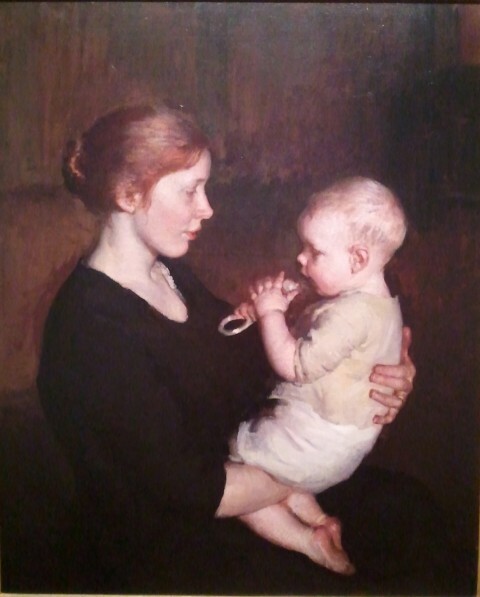 Besides the aesthetic beauty of the piece, it is interesting that even as she is trying to establish herself as a serious artist, she chooses to highlight her role as a mother and is not sacrificing her familial relationships in her quest for success (which resonates with me as that tension is something many have to struggle with today). Hi Courtney! Thanks for your comment! I especially love the self-portraits of Vigée-Lebrun with her daughter, Julie. And I like the reasons why you are drawn to these types of paintings. It’s interesting to me how other mother-artists like Lavinia Fontana (who had eleven children!) were apparently not as compelled – insofar as we know – to paint themselves with their children. Thanks for sharing this Picasso drawing, Tricia! I’ve never seen it before. I love the tender touches that are exchanged between the child and the mother. The hands and fingers for both figures are draw quite beautifully, with some gentle sloping lines.